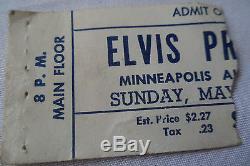 ELVIS PRESLEY ticket stub from May 13th, 1956!! The show was at the Minneapolis Auditorium. Although Elvis toured enormously early on from 1954 to 1955, VERY FEW stubs remain, as almost all the venues where he played were outdoor fairs with general admission and no real stub. Stubs from 1956 are a little more common, but still very scarce for some of the same reasons. Although, by then at least he was headlining at local concert venues. Even though his attendance was strong, the concert crowds and venues were very small back then, a few thousand or less. Rock and roll was a very new thing, and so were live pop concerts. Then starting November 1956 he started to tour less and only toured in early 1957 before stopping altogether until the 70's (except for a few special engagements). So any stub from the 50's is an extremely treasured collectible. Of course there may be more out there stashed away, and others that haven't surfaced yet, but some will be lost and many just don't enter the marketplace. One thing is guaranteed, demand is growing strong for these stubs, so they will only get harder and harder to find and more expensive. Still a very nice specimen. 1.5" x 2.25". Please leave me a good positive comment so that I know you received your item and everything is fine, I will reciprocate. Thank you for shopping at ClaudeUSA. 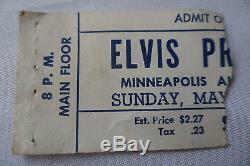 The item "ELVIS original 1956 CONCERT TICKET STUB! -Minneapolis" is in sale since Monday, May 18, 2015. This item is in the category "Entertainment Memorabilia\Music Memorabilia\Rock & Pop\Artists P\Presley, Elvis\Concert & Movie Memorabilia". The seller is "claudeusa" and is located in Orlando, Florida. 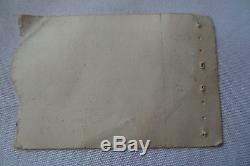 This item can be shipped to United States, to all countries in Europe, to Canada, to Japan, to Australia.